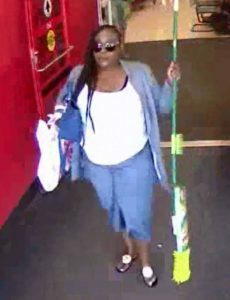 We are attempting to identify the pictured female who allegedly used stolen credit cards to purchase in excess of $2,000.00 worth of items, including gift cards, from Target on Hooper Ave in Toms River. Anyone with information should contact Detective Jen Grob at 732-349-0150 x1319 or by email at jgrob@trpolice.org. All calls are kept confidential. The media and the public are reminded that criminal charges are accusations only. Every criminal defendant is presumed innocent unless and until proven guilty in court.